Our dogs are all about making fresh tracks. They gleefully bound through the snow,making a Family Circus path that will no doubt impress any beasts unlucky enough to come behind them. It’s a romp that never fails to delight and tire our dogs, the perfect combination for a winter excursion. But add just a little wrinkle into the equation – single digit temperatures, a biting wind or some freezing rain for example – and the whole experience goes downhill. No weather is going to hold back our little buddies from making the most of each expedition, but it’s hard to call it a success when they come back shivering from the elements. Some dogs are more at risk to the cold than others. The smaller the animal, the more likely it is to fall victim to the weather. Dogs who have evolved to enjoy short hair or light coats can also feel the cold more deeply. Older dogs and those with weaker immune systems tend to be affected more by the weather than their younger pack members. Nobody, least of all your canine friend, has time to wait around for the perfect weather conditions to get out and enjoy some cold weather playtime. We say don’t bother waiting. Treat your furry friend to the same amenities you would expect in the colder months, a nice winter dog coat. The Element Dog Jacket provides everything you’ll need to let your dog run free safely and comfortably in the harshest of conditions. The windproof, waterproof and reflective jacket is a snug piece of fleece-lined, take-anywhere warmth. bulky as to get in the way of playtime. The Element coat fits around the neck and buckles across the stomach, keeping material away from important movement areas like the armpits, knees and back legs. It comes in six different sizes, all of which have adjustable buckles. There will be one that fits your dog. A dog jacket must keep you dry. Dog sweaters and other water absorbing outerwear are just fine for cold weather – right up until any moisture is present. Remember, it doesn’t have to be snowing or raining for your dog to play in s now or water. As soon that moisture gets into your dog’s gear it will hurt more than it helps. When is the last time you enjoyed being outside in the winter with soaked clothes? The waterproof material on the Element Jacket uses 600 Denier material, which makes it durable, versatile and flexible. Most importantly, it turns rain and snow from a hindrance into a toy. A dog jacket must work in any conditions. Don’t waste time on dog coats that specialize to only one type of weather. A good jacket is going to not only keep your dog warm, but act as a comfort for him no matter where you are. 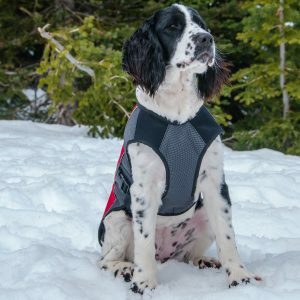 Anxiety over the unknown can ruin exercise time for a dog, putting on his jacket should have the same calming, reassuring effect as any other part of your daily routine, such as putting on a leash. If it only comes out in rare occasions, it misses the mark. That’s why the Element jacket has lightweight materials, including the waterproof materials and pill-free fleece, that make it easy to wear across the spectrum of relatively tame to very harsh weather. 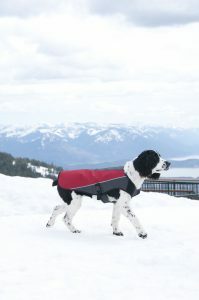 It has a zipper that gives easy access to an underlying harness or collar. There is no need to pick and choose your spots, just keep the jacket around for any sign of trouble – small or large – and easily pop it on. A dog jacket must be safe. Dark colors, protruding buckles or tags and bulky design can all cause problems when used by an active canine. The colors can make it more difficult to see your pet at night – or cause her to be misidentified by hunters. Materials that jut out from a jacket allow a dog to chew or get snagged, which can limit movement or coverage. Reflective surfaces, bright colors and sleek design are hallmarks of the Element Dog Jacket, precisely for those reasons. These safety features make this the right jacket for hiking, mountaineering or any other kind of exploring during any time of day. There are still months of cold weather this season. With one of these jackets your furry friend won’t have to simply endure the season until it heats back up, she can celebrate it instead.